The curve is pointing up, this hands off site, is growing on all levels. It increases monthly in traffic, rankings, and sales. Maybe most importantly it’s starting to get some traction, it’s getting noticed not only by consumers, but brands are showing interest as well. I received a free product today, from one brand that wants me to review their product. Highly relevant to what I’m doing so will happily try the product and review it. This is a confirmation that the site is on the right track and I’m very excited for our second year with this site. This case study series was created so that you can follow along, on the ups and downs. Learn from my mistakes and experience, and create a great site for yourself, monetized with Amazon. 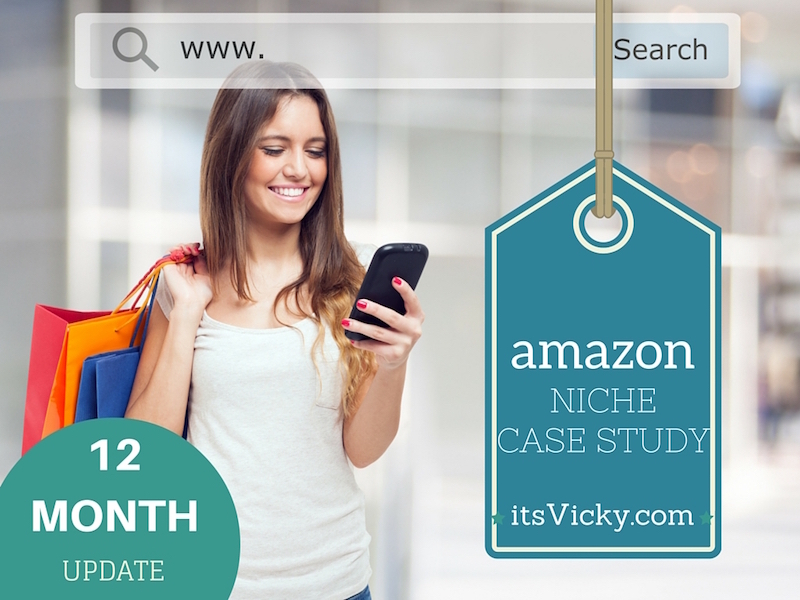 In this article, we will take a look at the first year with our Amazon cases study site. Looking back at this first year, with this Amazon site, I’ve learned a lot. From the mistakes I’ve done, I will grow and learn, and hopefully not make them again. If you want to make decent money, you have to promote high ticket items with Amazon. The products I’ve reviewed this year has mostly cost between $20 – $100. These have converted very well. Since I sold a decent amount, that means that for the last few months I got a bump in the % earning, earning around 7%. (You start out each month with 4%). The increase in % is great, but to increase earnings, you want to review high ticket items as well. That’s where I fell short. It will take you the same amount of time to review a $50 item as it will reviewing a $350 item. Might as well do both. So going forward I will dive into some more high ticket sub-niches, to try and get those additional high ticket sales to help bump up earnings for the coming year. I want this to be a hands off site and since I outsource most content it is. One thing I do want to take the time to do is video. Video is a great way to drive traffic. My plan was to do weekly videos, that didn’t really happen. I did submit about 10 videos to YouTube and most of them are ranking on the first page of Google for its keyword. Going forward I will priorities video. It does not take much to click that share button. Social media is an area where I need to improve on this site. I did set up a Twitter account for the site but have not done much with it since. Social media is a great way to create, brand awareness and drive some traffic to the site. For the coming year, social media like Twitter and G+ must improve. Over the year I have submitted 155 posts and pages. This is really the backbone of this site. I have consistently submitted 2-3 posts weekly. Most of this content has been outsourced. I’m lucky to have found a great writer with niche expertise. This allows me to be pretty hands off with the site, which has been the goal all along. Not all but most posts are keyword based. I take use of long tail keywords to rank the content organically. This has proven to be a good strategy for the site, and it grows consistently in both traffic and keyword rankings. Social Media – Some of the traffic do come from the two platforms that I have used occasionally Twitter and YouTube. The numbers are slowly increasing, it will be very interesting to see if the positive trend will continue over the summer since my sub-niche has its peak during the winter months. I’m happy to see that my “low traffic days” are now over a 100 visitors. Great content – great content should always be in focus for organic listings. Provide helpful information to your readers. Long tail keyword – help Google and other search engines rank your content by using long tail keywords. This is a long-term strategy that will help the site grow slow and steady over time. Inbound links – link within your website, point to helpful resources, reviews and other information that you share on your site. Outgoing links – link out to authority sites and other great resources when suitable. This proves that you are really trying to help your readers, even if it’s not on your site. I went from 0 to 1.8K ranked keywords according to Semrush. I would say that’s a good start for the site. I see this increasing continuing to submit helpful content on a regular basis. The traffic number is “users expected to visit the site the following month through organic listings”, I see this number being off from looking at the Google Analytics. Traffic cost is the est. price of organic keywords if they would be bought in Google Adwords. The ranking results have been improving over the year and that’s what I’m looking for the positive trend. This site is monetized with Amazon. The sales have been increasing month by month, again the positive trend I’m looking for. What I need to do going forward is to review more high ticket items. I will focus on a couple of sub-niches with high ticket items to try and increase the sales amount. Overall though I’m happy with the positive trend. Also for a hands off site like this, I’ll take the extra money. This is not an income to retire on, but I like the improvements. There’s always initial costs starting a site and it took a few months to catch up. The first year finished on a positive note so that’s a great thing. What I’m looking at is the positive trend, again. The site is growing and increasing revenue each and every month. If I can keep the momentum, I believe the Holiday months, November and December will deliver great results for this case study site. Find more high ticket items to promote – this is a must for me, to increase revenue. Find an additional writer for product reviews – the writer onboard is a niche expert, will be looking for an additional writer that write excellent product reviews. Solid summer month niche – Since I have a good sub-niche for the winter months, I want to make sure I find a solid relevant sub-niche with a focus on the summer months. Content Submission – Submit at least 3 articles weekly, maybe crank it up even more through out the year. Traffic – This year the site went from 300 to 3,000 the first year. My traffic goal for year 2, is to reach 20,000 unique visitors monthly. Sales – Within a year I went from 0 to 141 monthly sales. My goal for the coming year is to reach 700 sales within a month. If I reach my traffic goal this should be doable. Work with more brands – Like I mentioned in the beginning, I have had one brand contact me, asking me to do a review of their product and working more closely with them. This is something I would like to do more of. I see this as my site is getting traction, not only consumers but also brands are starting to noticing the site. A good place to be and I’m excited for the year ahead. 14 Month Update, See How the Site Improved! 6 Month Update Is the Site Out of the Red Yet? As always I want to hear from you! Feel free to chime in below in the comment section. I’m impressed Vicky. This site is more than covering expenses, it sounds like it is mostly hands off and the numbers keep getting bigger each month. My own experiment with an Amazon site failed. My conversion rate was no where near what you are getting. Will be very interesting to see how this site keeps growing. Thank you! Maybe you should give amazon another shot? I know it’s growing slowly, but I’m looking forward to year 2, to see how much it can grow and improve. The first year is always the hardest when you start something new, if you stick with it though, the rewards can be great. I really appreciate you sharing your tips within this case study as an Amazon Associate. I like that mention the mistakes that you make along the way. This will help me with my tech niche site to improve more. I have not yet invested in any outsourcing materials as yet, but I know as soon as the ball is rolling, I will be taking advantage of this. Where would y0u suggest that I outsource from and what are the fees involved for something like content creation? Thank you so much for sharing this vital and important information to me. Wishing you a lot more success online the way. Thank you! I prefer hiring writers on an ongoing basis. My writers usually write 3-5 articles weekly for me. I use upwork former odesk, to hire my writers and have had good results with that. I pay $6 – $12+ / article depending on what I need. Hi Vicky! Thanks for all of the information that you share. Would love to take a look at this website, but could not see a link. People sometimes get a little dubious when you talk, but don’t show the actual website. Also, about outsourcing the writing. I know a lot of people do that, and I understand the reasoning. It fees you up for other business building activities. I’m not sure I can bring myself to do it though. I’ve worked as a writer online and offline. My online experience is that we are treated like sweatshop workers. The pay online is generally much, much lower than online. In fact, other than a couple of upscale sites like Constant Content, it is insulting to pay 5-6 dollars for the work that goes into some of these articles. As i said, I understand it, but I’m not sure I’ll be able to bring myself to do it at any point. I always feel like I would be ripping people off who just don’t have the confidence to ask for what they are worth. Just a few thoughts. Thanks again for your sharing and info! As far as outsourcing goes, most of my writers has been with me for years. They are happy to have an ongoing job where they know they get paid and they know what to expect. There are many reasons to why people write, I’m not getting into that. I feel good about helping people make their own money! I feel good about hiring people and paying them for their job! Yes, the copying issue online really is a nuisance!! About the writing, yes, I’ve seen and been part of a lot of discussions about that whole aspect of online work. There certainly are many different points of view. I appreciate you taking the time to share yours. Thank you again for responding so quickly. It’s a very positive point about your work and online presence. You are a real person who is obviously active and interacts with readers. I really like that! Very true we all look at writing and outsourcing differently… and that’s ok :). I love interacting with my readers, I love different opinions it opens up discussions that other readers can learn from as well. Thanks Vicky, Very interesting read. I look forward to implementing your strategies in a big way! Glad you enjoyed this post Jim! You know Vicki, this is GREAT information with useful tips and you follow it up with real results. Love it! Congrats on making it one year. I’m 6 months in with blogging & haven’t made anything yet. Although I haven’t really focused on monetization, trying to attract readers instead. But I have used this experience as my wife & I are getting ready to launch a new home-based business site! Sites and blogs are different, with many different goals in mind. Sounds like you have learned a lot the first 6 months and are now implementing that in your new site. That’s something money can’t buy. This is so grounded in reality. If you have time, it is worthy a tutorial because many of us IM aspirants sometimes miss reality – like earning $1000 in the first month! You broke it down in a way that is real and helps to plan properly. I have bookmarked your site as a place to get back to for reality check. Lots of nuggets here. That was my goal with this site, to give real results so that others can get realistic expectations. I feel that many quit because they didn’t make that $1 K the first month of running a site. I’m sure there are some people out there making $1K the first month but the truth is MOST people are not. When starting out there are a lot of things to learn and that’s the key, to learn, implement and adjust. Figure out what works for you and your site… that takes time. Feel free to come back anytime you want! I sincerely appreciate all the breakdown of cost and profits you have demonstrated on this post. I always like to see REAL numbers. After reading this I do see the potential in reviewing items on Amazon. I’m a numbers person too. Numbers just makes sense to me lol. There is definitely potential and I’m excited to see what the second year can bring. What fantastic results and article! You deserve a big “Congrats” on your success! You really gave a lot of helpful hints for those just getting started, and even for some more advanced I believe. Thank you for the breakdown, it’s nice to see real money being made and a steady incline! Glad you enjoyed the post Sam. Do you run an amazon site yourself? Would love to hear your experience with it. Another great article, Veronica. I also outsource content but not reviews. I’m going to see if my writer is a good review writer. I’m going to give her your outline, Thanks again! Hugs! Hope you and yours are staying healthy. Thank you! If you have a clear outline for your writer I’m sure the reviews will be good. Amazon is always win win. Do you update all those sites on a regular basis with new content? Are you running smaller niche site or are these larger sites?